Chainsaw Warrior is a classic 1987 Games Workshop solo board game being brought to mobile and desktop by Auroch Digital. Now available on iPhone, iPad and iPod Touch and Android (via Google Play) and PC (via Steam). Join us on Reddit to chat about our games or sign up to our newsletter for the latest news! Below is information to help you with the game. They are organised by platform. Please check though the article before emailing us, as you may get an answer quicker that way! For more on the game, see here. NB: We also makes games over at our newsgaming project, GameTheNews.net. If you’ve come here looking for support for those titles, then try here. Please note that for the achievements to work you need to have Game Center enabled and to be logged in. It is a free service with lots of great features. So if you want to track your progress and unlock them all, please make sure you have it running. If you made it active after you’ve completed something that should have rewarded you with an achievement, then the system won’t have picked it up. It will only pick them up from the point where Game Center is enabled. As a game with lots of graphics, animations and effects, it may push your iOS device hard. To enjoy the game optimally we suggest making sure the battery is fully charged and/or the device is plugged into the mains. You can also ensure that your device has plenty of free memory by fully quitting applications you are not using, as pressing the home button to close an app does not mean it is not still running in the background. For more on closing app to free up memory see this video. Then select the ‘Running‘ tab at the top of the screen. This will then list all of the running applications. Simply select each one and then press ‘Force stop‘ before hitting the back button to select the next one. Repeat until all are closed. Now also quit Chainsaw Warrior, if it is running. Check that your internet connection is working. The phone needs to check with Google Play to confirm it is valid. Then go to Google Play. Please then log out (if logged in) and log back in. This should refresh the cache storage of the licence so you can play without problems. Select ‘Settings’ then ‘SD card and phone storage’ on your phone. Check the ‘Available space’ figure. If it is less than 1MB we suggest you free up more storage for the save files to work properly. For Steam released questions, please see here. Unzip the contents of the file. Right Click on the chainsawwarrior.x86 file. Go to properties, go to the permissions tab. 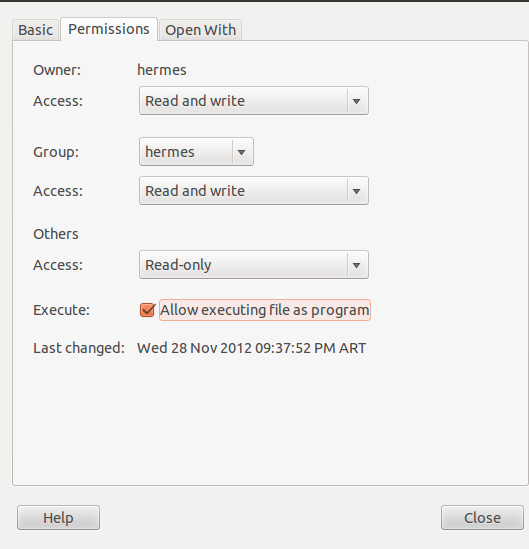 Click in the "Allow executing file as program". For more info including command line versions of this process, see here. If none of these answer your problems, then email us at gtn at aurochdigital dot com and we’ll do our best to answer them. We’ve done our best to make the game work fully and be bug free, however it is inevitable that we’ll miss things. If you spot something that is a problem then you may wish to help us and your fellow gamers by reporting the bug to us so we can try to fix it. There is some additional information which would be a huge help if you could gather. If you are using an iOS device: It helps for us to know what type of device it is (iPhone, iPad or iPod Touch) and what version, that is a huge help. Just add this information to the email. If you don’t know then these guides will help – iPhone, iPod Touch or iPad version guide. It also helps us to know what version of the iOS operating system you are currently running. There is a guide to identifying the iOS operating system version number here. If you are using an Android device: It is a huge help to tell us what sort of phone or tablet it is? There is a guide to the device here. If you could also tell us what operating system the device is running too? It is below the red arrow in the link above, where it says ‘Android version’. If you are using a PC: It is a huge help to know what sort of PC it is and what version of Windows you are running (help to find out is here). If you are using a Mac, then it helps us to know the model and the version (help is here) of the operating system you are running (help is here). Thanks and good luck playing the game – you’ll need it!